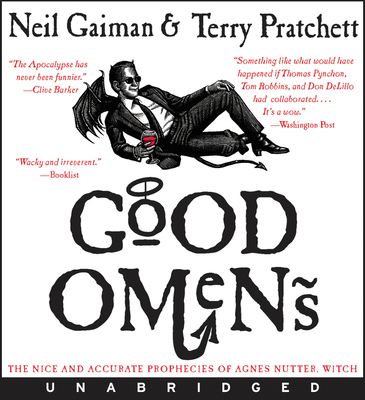 Good Omens professes itself to be "The Nice and Accurate Prophecies of Agnes Nutter, Witch," the only accurate prophecy out there, and the only prophecy not taken seriously by any who read it. It is the tale of the final battle between Heaven and Hell, the coming of the apocalypse, etc, etc, etc. There's the son of the Devil and everything. Except that in the thousands of years they have spent on Earth in preparation for the battle, our angel and our demon have sort of become fast friends, drinking and dining and reading together in the back room of a small bookshop. And they also happen to be completely incompetent, and lose the Devil's son, and thereby create a whole lot of chaos and angry beings of religion. It sounds a bit dopey, I know, but it works. And the audiobook, narrated by Martin Jarvis, is spot-on, stupendous, and outright hilarious, with Jarvis hitting the humorous notes in all the right ways. And because the story relies so heavily on snark and wit, this timing, this intonation, is crucial. Though not the best book I read last year, Good Omens was a good first foray into both Neil Gaiman's work and Terry Pratchett's, and as a self-proclaimed fantasy reader, I was ashamed to have to admit I hadn't read either. Though perhaps I took a shortcut in tackling both at once, I'm glad I did: the combination is relatively seamless, and the author's voices blend almost as though they were meant to be, and I was left with a good laugh, some thoughtful commentary on religion as a whole (a topic Gaiman seems to explore on more than one occasion across his canon), and a desire to explore more of both writers. This was actually my intro to both Gaiman and Pratchett. And while I've gone on to love Gaiman, I have yet to read anything else by Pratchett. I made the mistake of reading this on a cross-country flight. I nearly choked trying to keep my laughter under control! It's funny, while I read other works by Neil Gaiman before and after reading Good Owens, it was a few years before I picked up anything else by Terry Pratchett. I read his Tiffany Aching series last year and promptly recommended them to my mother, who is now on a big Pratchett kick. He's a fun read.